Growing cilantro reminds me of the saying, live fast, die young. This annual herb grows quickly, blooms, sets seed...then it's all over before you know it. But if you keep a few key things in mind, you'll have a long season of tender, young leaves to harvest. 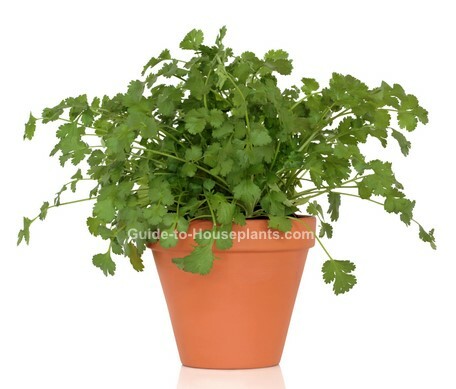 Cilantro plant grows a central stem covered with oval, toothed leaves. It branches naturally. The side branches have leaves that are more deeply cut than those on the main stem. When in bloom, the umbrella-shaped clusters of tiny, white or pale pink flowers resemble Queen Anne's lace. You can expect flowers in spring or summer, depending on when the seeds were sown. Did you know...Cilantro is in the Umbelliferae family along with carrots and parsley. All parts of cilantro -- including the roots -- are edible and loaded with nutrients. What's in a Name? Cilantro plants are sometimes referred to as coriander plants or Chinese parsley. What is coriander? Cilantro seeds are referred to as coriander. The dried seeds are commonly used in cooking. Growing cilantro from seed works best because this herb doesn't like to be repotted. Most seed companies offer varieties that are slower to flower and set seed, or bolt. When buying cilantro seed online or in catalogs, look for the words non-bolting or slow to bolt. These varieties will give you a longer cilantro growing season. Calypso and Santo are two slow-to-bolt varieties. Give it space. Plant cilantro seeds in a container at least 8 in (20 cm) deep. It has long taproots and hates to be repotted. 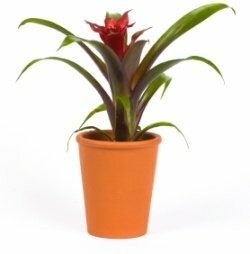 Use a pot with a drainage hole and well-drained potting mix to prevent overwatering, which can cause root rot. Shed some light. For the best flavor and lush, leafy foliage, growing cilantro needs plenty of sun. Give this culinary herb a sunny spot on a windowsill -- or shift it to a porch or patio for the warm months. Keep it cool. If you live where the summers are very hot, keep it shaded during the hottest part of the day. High temperatures will rush the plant into flowering, followed by seeds. Once this herb sets seeds, it will stop producing leaves. Give it a drink. Growing cilantro plants are thirsty. Water thoroughly and regularly. Check on it often because potted herbs -- especially if grown outdoors -- dry out quickly. Harvest cilantro leaves often because this herb is fast-growing and bolts (goes to seed) quickly. Begin harvesting young leaves when your plant has reached about 6 in (15 cm) tall. Cut the leafy stems right at the soil level. Young leaves are tastiest -- older leaves can be bitter. Cilantro leaves are best used fresh. It doesn't freeze well and dried cilantro loses most of its flavor. The leaves and stems have a sharp flavor and a pungent aroma. All parts of the plant are edible. 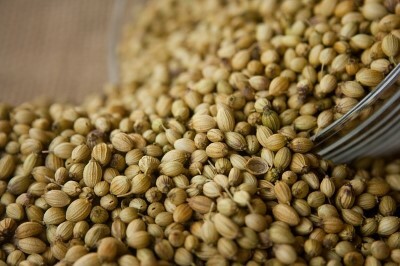 Dried cilantro seed, also known as coriander, packs a lot of flavor too. Cilantro complements savory dishes -- especially spicy Asian, Indian, Mexican and Middle-eastern meals -- as well as soups, salads and salsas. Harvesting cilantro seeds. 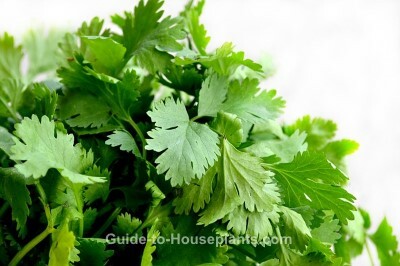 You can plant newly produced seeds immediately to keep growing cilantro for a continuous harvest. 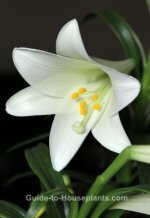 If you want to use the seeds for cooking, allow the flowers to bloom and fade on the plant. You want to catch them at the right time...Clip off the seed heads just when they start to turn brown. If seeds are picked too early, they may be bitter. And if you wait too long, the plant will drop all the seeds onto the soil. Want a fast way to dry seeds for cooking? Dry them in your oven. Set the oven at the lowest temperature possible. Spread the seeds in a single layer on a cookie sheet and set them in the oven until they are completely dry. To check if they're "done", try to bend one of the seeds in half. If it's still flexible, it's not dry yet. Saving seeds for next year's crop? Allow the seeds to dry in a paper bag. Don't use plastic because it retains moisture. Label it and store the bag in a cool spot away from sunlight. Storing cilantro seeds is worth it -- they store well. Light: Full sun to partial shade. At least 6 hours of direct sun per day. Turn plant for even growth because it will tend to grow toward the light source. If growing cilantro under indoor plant lights, keep the light 6 in (15 cm) above the plant and leave it on for 14 hours a day. This is the equivalent of 6 hours of sun. Water: Keep soil evenly moist. Temperature: Average room temperatures 60-75°F/16-24°C. Fertilizer: Feed spring through fall with a balanced fertilizer. Herb fertilizer works well on cilantro and many other types of herbs, giving them just the right balance of nutrients. Propagation: Sow seeds indoors in late winter or early spring, covering seeds lightly with potting mix. Keep it moist but not soggy. Seeds will germinate in about 2 weeks. Thin out the seedlings so the remaining plants have room to grow. Handle seedlings with care -- cilantro herbs have long taproots and don't like to be repotted or disturbed.